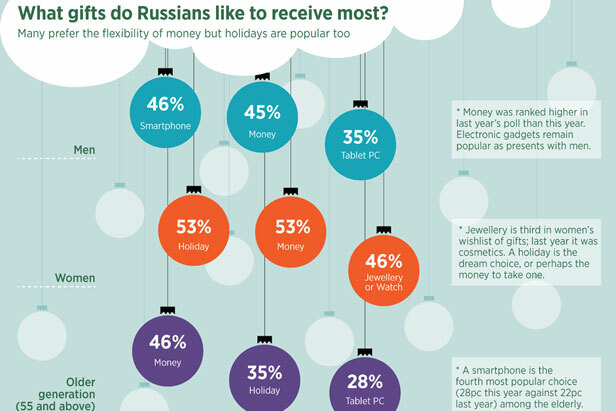 What gifts do Russians like to receive most? Russians are ready to spend more during this year’s holidays season than they did last year as a distraction from problems. Russians surveyed said they were willing to spend 13 percent more this holiday season with an average budget of 443 euros (19,200 rub). The second item in expenditure for the New Year is food and drinks. Their costs this year, as expected, will grow by 8 percent to 174 euros. Entertainments will demand the most lowest expenses of Russians at only 71 euros.